These are the words of the most notorious bounty hunter in all of the Old World. From the palazzos of Tilea to the fortresses of Bretonnia to the alleys of Altdorf, no man is feared more then the bounty killer Brunner. All who have heard his name know his reputation as a hunter, as long as the price is right and the target sane, it isn’t a question of if he will get them.. its a question of when. C.L Werner has created a very rare type of character with Brunner. While most characters are suited for long series of novels with a few short stories thrown in for bridging gaps, Brunner is more suited to the realm of short stories, the better to tell more of his exploits across the Old World. And that creates quite an interesting series. The series so far consists of two short story anthologies, Blood and Steel and Blood Money, which each contain several exploits of Brunner set in many stunning locales against dangerous foes. And the third is a full novel, Blood of the Dragon, which pits Brunner against the most dangerous foe in the entire omnibus. The characterization in the series is quite varied, Brunner being the only permanent character in the series. An anti-hero with a brutal honour streak Brunner is quite a morally complex character. Driven by a mysterious past Brunner has no qualms about whom or what he hunts, he will kill the innocent or the falsely accused for the right price, but once on the hunt he will not be swayed away, even an king’s ransom will not save his prey from being brought in. Orcs and Goblins, the warriors of the Dark Gods, and even foes more ancient then the Empire itself all stand in the way of Brunner’s precious gold, and he’ll let none stop him in his hunts. The remainder of the characters only appear once in the series, or at best twice. However they are very interesting, many an erstwhile ally or source for Brunner, and many more a deadly foe. Some of the more notable and deadly include Krogh, the shadowy mutant and a rival hunter, Skrim Gnaw-Tail, an agent of the Skaven in Altdorf, and Pulslitz, a champion of the Grandfather of Plagues. The absence of a large base of recurring characters allows many different and varied characters to be used in the series and creates many different foes for Brunner, those who want him dead and those who want to use him. The action in the series is great and well-styled as Brunner faces all sorts of enemies with his arsenal of weaponry. The enchanted blade Drakesmalice and his trusty Tilean-made pistol to name a few. Each hunt of Brunner’s varies in nature, from hunting down escaped fugitives, from recovering ancient artefacts, or slaying an enemy warlord for coin, each different story and hunt is well-written and a great read. The pace varied throughout the different stories. It goes from quick and urgent to slow and cautious as befits Brunner’s current situation. In-depth explanation of lore or events was only given when absolutely needed. 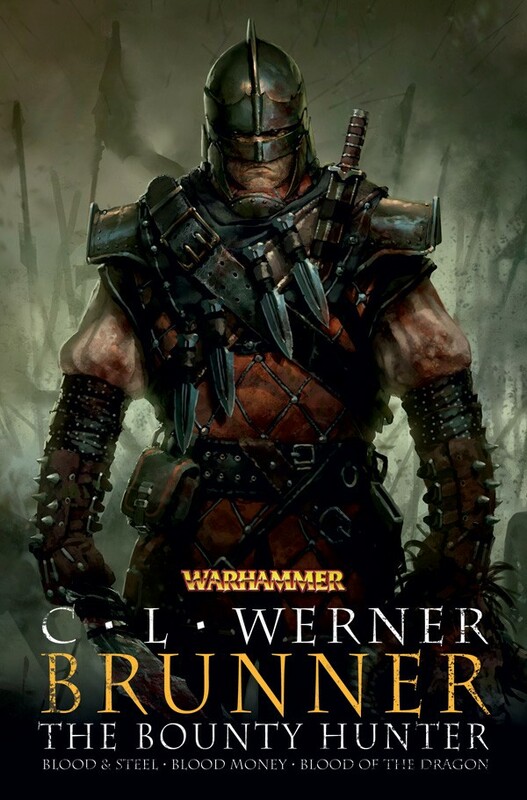 The omnibus may finish with Blood of the Dragon but the adventures of Brunner are far from over, C.L Werner himself has said he will return to Brunner one day soon, once his schedule lightens a bit. But the ending of the full novel was ominous and action-packed, leaving me wanting more and more. My rating for Brunner the Bounty Hunter is a well-deserved 9/10 for a wide and varied selection of stories, unique and interesting characters in every story short and long, and a look into the grim world of the bounty killer Brunner. Should you buy this book?, Yes. Yes you should.